Delve into astronomy, chemistry, weather, physics, geology, and more with interactive experiments in this fun, hands-on kit! Learn about materials and matter, sound and light, motion and gravity, electricity and magnetism, chemical reactions, as you make amazing things like rockets, a periscope, a lava lamp, a worm hotel, and soap-powered boats. How would you like to make a sound sandwich or a straw whistle? Split light into colors? Slice ice with a wire? 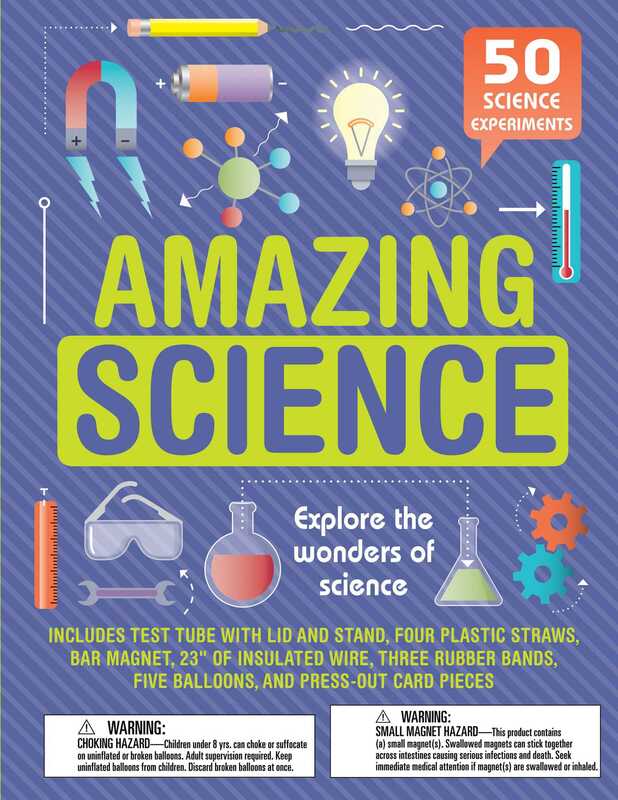 Now you can with the 64-page illustrated instruction booklet, test tube, magnet, balloons, and more! Anna Claybourne is an experienced children’s author who has published more than 200 books on all kinds of topics, ranging from Shakespeare, space science, and Surrealism to experiments, earthquakes, and endangered species. She specializes in science and nature, literature, and arts and craft books, but also writes fiction and retellings. She lives in Edinburgh, UK, with her family and two cats. Besides writing, she likes camping, sewing, and music, and she plays the trombone.